Watch full RWBY Season 4 Episode 11 full HD online. RWBY Episode 51 online for free in HD. In Salem’s castle, Cinder has difficulty defeating a horde of Grimm during her training. Salem criticizes her for holding back her new powers, but she is interrupted by the arrival of Tyrian. He hopes for forgiveness when he confesses his failure to capture Ruby, mentioning that he managed to poison Qrow. Salem voices her disappointment and leaves, while Tyrian cries out and brutally takes out his anger on a Beowolf. On Patch, Yang spray paints her bionic arm and prepares her motorcycle, seemingly ready to leave. Taiyang appears behind her and asks where she is going. He reveals that he knows that Qrow has told Yang about Raven’s possible location, something he specifically asked him not to do. Taiyang now wants to know if Yang will search for her mother, or go to Mistral to find her sister Ruby. Yang looks back at him, but doesn’t give an answer. 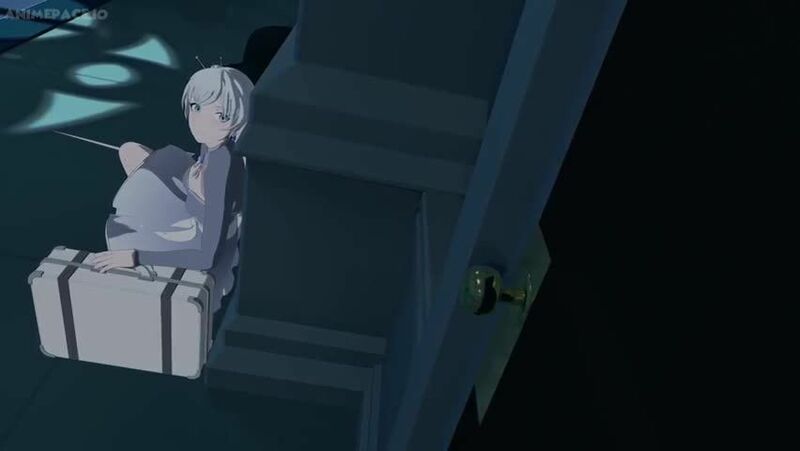 In the Schnee manor, Weiss sneaks out of her room, suitcase and weapon in hand, and meets with Klein. He leads her through the castle, but they have to split up briefly. Weiss sneaks by her father’s study, where she overhears another argument between Jacques and Ironwood. The general reveals that he sent Winter to Mistral to investigate possible enemy activities, and a report from her suggests that something is in motion. Ironwood reveals to Jacques that he will be closing Atlas’s border in a week to ensure the safety of its citizens. Nobody will be able to enter or leave without his permission. He also doesn’t trust the people responsible for Mistral’s safety to take care of the situation. As he turns to leave, Weiss quickly locks the door with a glyph, locking the men in the study. She hurries to the library, where Klein opens a secret passage for her. They share a heartfelt goodbye, and Weiss says that she will go to Mistral and find her sister. Sun wakes up in Ghira’s study, while Blake is sitting nearby. She reveals to him that what happened is exactly what she didn’t want to happen. She ran away from her team because she didn’t want her friends to get hurt because of her. Blake admits that she loves them dearly, but also hopes that they will hate her for leaving them. She is willing to accept the consequences of her actions. However, Sun argues back that Blake is not being selfless, and that her friends fight for her because they want to. He further argues that shutting her friends out of her life has hurt them more than what their enemies can do to them. Suddenly, Kali and Ghira interrupt them. The latter is embarrassed that they got caught eavesdropping. Ghira has also looked through Ilia’s scroll, and found out that Adam is planning to overthrow the White Fang leaders and start a full scale attack on Haven Academy. Blake says that they should try to take the White Fang back. Meanwhile, Ren and Nora rush towards Kuroyuri. They find Ruby and Jaune, who seem to be okay. However, Ren’s relief is short-lived, because the Nuckelavee-like Grimm now appears in front of them. Ren drops to his knees in horror.